The Brits are outnumbered, and the Zulus are outgunned. They both depend on music for morale. Politicians of all stripes hate free markets, because free markets aren't political. Free markets are just the expression of the free choices of free people. In daily life, free markets are more of an expression of a free people than is voting. The free market is like having an election all over the country countless times every single day. Our business on the formal election days is to make sure no one takes away our power of election the rest of the time. As every year, I will repost my poem Enid & Geraint. It must be among the oldest poems about 9/11, for I wrote it on that day, in the afternoon, when I could no longer watch the television replays of the falling towers. I shut off the machine, and went out into the forest, down to the creek that ran through the woods. I crossed it halfway onto an island, and sat among the stones and wrote this. Pat Buchanan: Are We Serious? Jones, who sells t-shirts saying "Islam is of the Devil," may be an Islamophobe, but he is also a serious man, willing to live with the consequences of his deeds, even if he causes U.S. war casualties. Yet President Lincoln arrested thousands of citizens and locked them up as security risks, while denying them habeas corpus. He shut newspapers and sent troops to block Maryland's elections, fearing Confederate sympathizers would win and take Maryland out of the Union. The other half of the argument has to do with whether this country, as opposed to those previous Americas, is willing to endure the President's use of such power. I think GEN Petraeus was right to speak as he did, but many seem to have considered it a stretch for a military officer even to mention that this idiot was likely to get troops killed so he could have his little show. The Drudge Report made a point of reminding us that the US military was in the Bible-burning business, but going out of its way to protect Korans from the same fate. There's no doubt that the Muslim world reacts more harshly to desecration of its religious symbols than the Christian world; but that, as Buchanan says, is a problem with us, not with them. I took the above notes while in my office at 71st Street between 2nd and 3rd Avenues, on September 11, 2001. We had managed to get through to the Internet for a few minutes, or -- and -- I was also on the phone with my Mother on Long Island, who was giving me info. 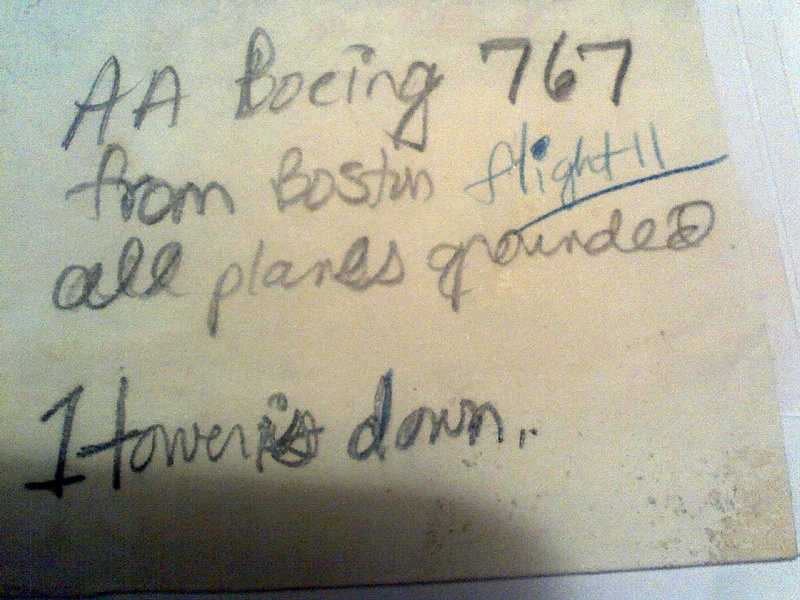 At the time of writing the note, only one tower was down. I remember I was in class at Hunter College earlier that morning (studying Urban Affairs, no less), and there was a commotion in the hall. We had a speaker due to our class that was running really late so the door was open. Another professor walked in and said "Two planes flew into the World Trade Center." Two planes... I knew it was no accident. And an image popped in my mind that I still cannot explain: of both towers toppling over. Not crumbling, as they did, but toppling over, and I knew what a victory that would be to maniacs in the Middle East. Actually, I'm not sure I consciously thought "Middle East" but I did picture it and its people cheering -- not a sight so unusual with regard to something bad happening to the U.S.. These thoughts all took place in less than ten or fifteen seconds and they were mostly visual, not even fully formed sentences in my mind. You could see smoke rising up (we were on the 17th floor looking south, straight down Lexington Avenue) between the buildings in the horizon (not the actual Trade Center but some buildings). A bunch of us left Hunter and headed to where we needed to go. I got to the street, turned the corner at 68th Street and 3rd Avenue, walking north to 71st, and heard a woman who I imagined had gotten her mother on the phone and said, in a shaky voice, "have you heard from Eileen?" I'll never forget her voice. I think she was asking about her sister. We literally were walking past one another. Eddie Bauer was on that corner. It's not there now but I remember it. On the other hand, the militia who arrived to do battle may be described in that way with less stretching. The warning here is a warning properly to those members of the Republican party who are looking at the Tea Party movement with the sense that they'll somehow be able to control and profit from it. The Founders had mostly thought they would be able to keep things calm as well -- until Lexington and Concord. George Washington received the news at Mount Vernon and wrote to a friend, "the once-happy and peaceful plains of America are either to be drenched in blood or inhabited by slaves. Sad alternative! But can a virtuous man hesitate in his choice?" No indeed: virtue compels, once that point has been reached. How many virtuous men, though, will you find among the politicians of the Republican Party? A UK magazine called Standpoint reviews two religious books that adopt naturalism as a means of defending -- rather than attacking -- religious faith. The reviewer is not impressed. This theistic framework is not the only possible framework for spirituality: both the writers under discussion flirt intermittently with the Buddhist notion of anatta — the idea that the self is an illusion and that there is nothing beyond a constant flow of impermanent conditions that arise and pass away. But it is no easy task to graft such ideas on to the ethical rootstock of Western spirituality. For one thing, it is far from clear how a worldview based on detachment and oceanic merging into the impersonal void could support anything like a morality of unconditional requirements that calls us to orient our lives towards the Good. We need, as Comte-Sponville rightly concedes, fidelity to the tradition that shaped us. But part of that tradition condemns intellectual pride and calls us to humility. A little humility may be enough to allow us to make the short step from fidelity to faith. We need the humility to accept that we cannot create our own values, or pick and choose the rootstock from which our fragile moral sensibilities have sprung. I'm not sure that I accept the reviewer's premise that naturally-oriented arguments are non-theistic. I've been reading Avicenna, as you know. A Muslim, and Persian, Avicenna is one of the most impressive thinkers I've ever encountered: his reputation is, if anything, understated. I had gotten the impression from books that mentioned him that he was mostly important to philosophy (as opposed to medicine) for having transmitted Aristotle, and some works of Plato, to the West. In fact, his philosophy synthesizes both Aristotle and Plato, and then adds unique elements that are originally present in neither -- but which are demanding and deeply considered. It's not for no reason that he was widely read by Medieval thinkers, or that much of his thought was incorporated by philosophers like St. Thomas Aquinas. Consider his proof for the existence of God. You can read the original in his Metaphysics, but it's pretty dense stuff: the commentary I've linked to may be easier if you aren't philosophers yourselves. I'll further gloss the commentary below. Avicenna leaves the conceptual realm for a single empirical datum: "There is no doubt that something exists." This is the same thing that St. Augustine and, later, Descartes came away with as an undoubtable truth. Descartes' formula is the most famous today, but he was the last of the three. Avicenna proceeds: "Everything that exists is either necessary [by reason of itself] or possible [by reason of itself and necessary by reason of another]." If something exists, that is, it must at least be possible for it to exist. If it weren't possible, it couldn't exist! That much is easy to understand. Why "necessary," though? The argument hinges on the idea of where one 'gets' existence. Whether we're talking about a natural thing or an artifact of human creation, how can something come to exist? A horse can be bred by two other horses; a house can be built by a man. Gases in space can collect together and form a planet. But in all cases, the new thing that comes to exist is obtaining existence from something that already exists. Therefore, if any single thing exists, it is necessary that something else existed to give it existence (if that first thing doesn't, itself, exist by necessity). Nothing can give existence if it does not exist itself. The parent horses had to exist if there is a foal; the men had to exist if there is a house; the gases in space had to exist if there is a planet. Those things, since they exist, had to have something that existed prior to them... etc. Avicenna notes that you could go back through an infinite regress if you don't anchor this somewhere (this problem was first recognized by Agrippa the Skeptic). Avicenna doesn't rely on that argument, though: he points out that it's enough to recognize the necessity in the first step. If we know that something exists, we already can make a necessary claim: either (a) it was necessary in itself, or (b) it is necessary that something else made it exist. If we rely on the infinite regress, we could potentially stop here: if something exists, then either it is necessary in itself, or it necessarily has a prior existent. At least one thing, then, necessarily has to exist in order for anything to exist: we just have to find out which one is 'necessary in itself' and we can stop. That isn't Avicenna's method, though. The next part of his proof hinges on the question of what holds things in existence, which he believes helps us establish the nature of what kind of thing could be 'necessary in itself.' We can go through that if you're interested. It's an interesting use of neoplatonic emanation to insist on the unity and one-ness of the necessary existent (which St. Thomas Aquinas has to answer, since he wants to hold that the 'necessary existent' is not one thing, but three-in-one). For now, though, I'd just like to note that there remain arguments for God that arise from naturalism, and which aren't adequately demonstrated false by either logic or science. They are very difficult and dense arguments, which are much harder to grapple with than most modern readers have patience for doing. As a result, they tend to be airily dismissed by moderns who haven't taken the trouble to fully understand the argument in the first place. That's a choice, but not a necessity. ...the federal debt held by the public increased by $2.5260 trillion, which is more than the cumulative total of the national debt held by the public that was amassed by all U.S. presidents from George Washington through Ronald Reagan. That's no problem, right? After all, look at all the good it's done. Why, unemployment is down... maybe. New unemployment claims supposedly dropped to 451,000 last week, hooray! But eight states (including California and Virginia) didn’t actually report jobless numbers last week because of the Labor Day holiday (ha), so the U.S. government just made up the numbers from those states, and those numbers are lower, hooray! Well, of course they are. If the numbers were higher, that would be "unexpected." Texan99 heaven, too, if it comes to that. 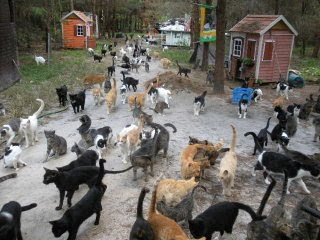 This is what my home would look like if my husband didn't play the heavy and keep me sane. It costs up to $6,000/month to run the 30-acre Caboodle Ranch. I'm not sure if his location is secret or what keeps the population of 500 from exploding to zillions of cats dumped from everywhere. The guy who runs this place has built all kinds of little treehouses and cottages and churches and City Halls for the cats to play in. A complete fruitcake: my kind of guy. I'd take this over a cocktail party any day. Exactly What Is A "Food Historian"? Apparently the adjective is intended to negate, rather than modify, the noun. Food historian Caroline Yeldham agreed, saying that highlighting modern eating patterns and contrasting them to medieval diets would make people think about what they ate. "The medieval diet was very fresh food. There were very few preserves so everything was made fresh and it was low in fat and low in salt and sugar." If by "preserves" you mean that they didn't can things, yes; if you mean they mostly ate "fresh" food, no, that has no bearing on reality. There were times of the year when they mostly ate fresh food! But the need to store against the long hungry seasons meant that a tremendous amount of what they ate was preserved, even if it wasn't "preserved." There are several ways besides canning to preserve food. Pickling is one; drying and smoking are two more. Meats in particular were often dried and cured, and kept at length; this is one reason that Medieval feasts often included boiled rather than roasted meats. Dried meat improves by boiling it, as the boiling reconstitutes it to some degree. 1) They ate less food. Consider the hardest-working modern American or Briton -- say, a road worker who labors all summer on the highway. He (almost certainly a he) is working long hours in terrible heat, yes; but he is also sitting down in powered equipment instead of digging ditches by hand, or harnessing and un-harnessing draft horses. He is taking a union-regulated lunch break, and going to a fast food joint where he can eat refined white bread and "fresh!" meat, and cheese, as much as he likes. The cost of the food is a pittance compared to his salary, when compared to what food cost in the Middle Ages. I yield place to none in my respect for the Middle Ages as a source of inspiration, but this is just foolish. It's like telling kids that they should eat their asparagus because there are starving children in Ethiopia. Well, perhaps there are; but the children are so spoiled that they'd simply think that was a good reason to ship the asparagus off, rather than realizing that they should appreciate what they've got. They've never had otherwise; and even the childish imagination has limits. An argument by analogy can sometimes be helpful... but only if the analogy fits. The story of 1937, of F.D.R.’s disastrous decision to heed those who said that it was time to slash the deficit, is well known. What’s less well known is the extent to which the public drew the wrong conclusions from the recession that followed: far from calling for a resumption of New Deal programs, voters lost faith in fiscal expansion. Consider Gallup polling from March 1938. Asked whether government spending should be increased to fight the slump, 63 percent of those polled said no. Asked whether it would be better to increase spending or to cut business taxes, only 15 percent favored spending; 63 percent favored tax cuts. And the 1938 election was a disaster for the Democrats, who lost 70 seats in the House and seven in the Senate. Had anyone proposed spending even a fraction that much before the war, people would have said the same things they’re saying today. Oh, right. Only one small point of disanalogy: the war also destroyed nearly all of our competition in the production of industrial goods, while leaving us with customers absolutely starved for replacements. Paying off all that debt therefore wasn't a problem: we had assured income in the form of people buying from us what they needed to put their country back together. Now, if the proposed stimulus will reduce all our competitors to ashes, leave our industrial base intact, and also require them to buy stuff from us to rebuild? Then I'll be convinced that the analogy holds. The famous writer, in 1968, via the BBC. Hat tip to Mr. Lars Walker, whose fine blog pointed me to it. “Watch out for that sword,” the rehearsal director shouted. The article is about the Beijing Opera, which is in some trouble as China turns away from its history and embraces the West. Western observers tend to think the opposite is happening -- that China is embracing a kind of resurgent Confucianism and seeking to regain its ancient imperial dominion. What seems to me to be the case is that they've embraced capitalism, and are seeking mostly greater control over their export corridors (as well as easier channels for exports). The Beijing Opera is worth some study, if you're not familiar with it. If you like Hong Kong cinema, the roots are in the Beijing Opera. If you were scratching your head in the 1990s at Xena, Warrior Princess -- it's because you were having your first encounter with the offshoots of the Beijing Opera. For instance, by modifying 刀 dāo, a pictogram for "knife", by marking the blade, an ideogram 刃 rèn for "blade" is obtained. In day to day life, much bargaining is done by hand signals. Even though almost every purchase requires haggling, I could easily do business in spite of my limited grasp of the language. Ten hand signals indicate numbers; and their use is expected, because of the dialect issue. The Beijing Opera carries this symbolism through elaborate postures designed to carry the meaning of the act. The Japanese, as the Japanese will, absorbed and refined this idea to its highest degree. Their version of this kind of opera is called Noh, which influenced the more famous later form Kabuki. You see elements of the elaborate-postures-as-signals in Spaghetti Westerns -- which were notably influenced by Japanese cinema -- and even in American film. Note how the constant movement of the snow emphasizes the pauses in the actors' movements, and therefore draws your attention to their poses and what they are signalling. So it's an interesting topic, this opera in Beijing. UPDATE: For a Spaghetti Western use of this concept, look no further than the closing scenes of The Good, The Bad, and the Ugly. Pigments absorb light in most wavelengths and reflect back in just a few, which our eyes detect as "color." But that's not the only way for things to appear colored to us. Rainbows result from clear raindrops, for instance, and from the mysterious habit of light to bend when it passes through the barrier between one clear medium and another, together with the even more curious fact that light of longer wavelengths (like red) bends more than that of shorter wavelengths (like violet). Suspended water droplets act like a prism: sunlight bends coming into each drop, then some of it bounces off the back of the drop, and bends again coming back out. The red bends more than the violet, the yellow in-between, giving us the effect of a spray of colors stretched across the sky: ROYGBIV. 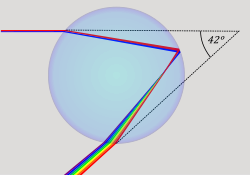 Why is the rainbow is only a pale reflection of the sun, instead of a glare like a glimpse of the sun in a polished mirror? For the same reason we catch only a ghostly, pale reflection in a window at night: when light passes through a thin clear layer, most of it goes out the other side, and only a little is reflected back. The reflected amount varies between zero and sixteen percent and achieves a maximum that depends on the thickness of the layer: specifically, what light wavelength it is a multiple of. Any particular thickness of layer will favor a particular associated color. A layer with a constantly varying thickness, like a sheen of oil on top of water, will shows swirls of color. We call this effect "iridescence," from Iris, the goddess of rainbows, the messenger of the gods. (The plural of "iris" is "irides"; this root also explains the spelling and is the only way I can remember not to give it a double "r" as in "irradiation.") 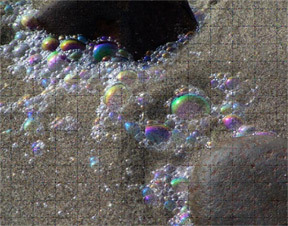 We see iridescence in soap bubbles, oil slicks, and some kinds of crystals. 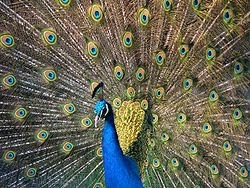 Many living creatures also have learned the iridescence trick, though strangely it's more common in reptiles, fish, birds, and insects than in mammals. An exception is the golden mole, a varmint that predates the entire dinosaur era and has several archaic properties such as a cloaca (a combined port for liquid and solid elimination). Its fur has a golden sheen that is said to be a function of iridescence. 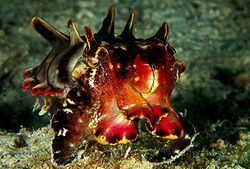 It "swims" through loose sand like a Dune sandworm, which I find charming, but it is iridescence I started out to discuss here, so I'll try to get back on topic. The Blue Morpho butterfly has iridescent wings, as do the scarab beetle and many birds, including the peacock and the hummingbird. Insects' effects usually result from thin, clear scales, while birds employ tiny periodic nanostructures in their feathers' hairlike "barbules." Cuttlefish (below left) use a combination of pigment and iridescence to exhibit color, which they can change instantly, like a TV screen. And of course, there are the beautiful nacres, formed from thin clear layers of shell. Here below find a video that combines my interest in feats of horsemanship with her interest in wiener dogs. I spent the weekend at the Ringgold Celtic Festival and Highland Games. The weather was beautiful, and many old friends were there. There's not much to say about it that would interest the readers, but that is why I've been so quiet. I've never been that enthusiastic about diamonds; I like a lot of vulgar color. So here's a semi-precious stone I can really get behind. Tourmaline is a silicate crystal that exhibits all kinds of colors depending on the traces of minerals that slip in. Not only does this result in an entertaining array of colors, it yields mind-boggling chemical formulae, like this for elbaite, a variety of tourmaline associated with the island of Elba: Na(Li1.5,Al1.5)Al6Si6O18(BO3)3(OH)4. 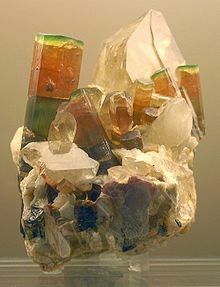 Tourmaline crystals are prismatic and columnar crystals that are usually triangular in cross-section. The style of termination at the ends of crystals is asymmetrical, so that a typical columnar crystal resembles a pencil, long and skinny with one flat end and one pointy end. 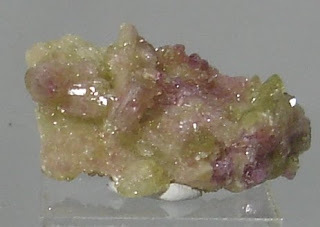 This asymmetry is called hemimorphism, and can result either from changes in crystallization conditions during the growth, or, as in the case of tourmaline, from alternating patterns inherent in the complicated crystal structure. 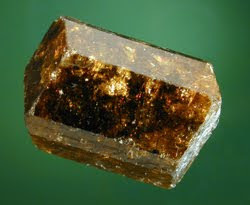 Hemimorphic crystals tend to display an unusual level of both pyroelectricity and piezoelectricity, meaning that if you heat or squeeze the crystal, the lattice does not expand or contract. 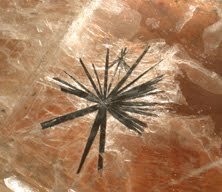 Instead, ions are displaced, which generates electrical potentials on the crystal faces. This effect occurs in a lot of crystals, some of which will generate a visible spark when crushed, but for some reason it is accentuated in asymmetrical crystals. MOTMC memberships are available in various levels at surprisingly affordable prices, for those of you with birthday issues looming. My birthday happens to be in November. Troops Turn Down "Stop Loss" Bonuses? The Washington Post reports that military servicemen required to remain on duty beyond their original discharge date during the last nine years are declining to submit the required paperwork to collect the bonuses that Congress voted for them last year. They are eligible for $500 for a month, for an average of several thousand dollars apiece. About 90,000 active servicemen and veterans (two-thirds of those eligible) have not turned in the applications, which are due on October 21. Why? An Army personnel officer thinks the servicemen may question whether the bonuses are legitimate and not some kind of gimmick. Too good to be true? Offensive to their culture? Officials are struggling to figure it out, with about $324 million in soon-to-expire benefits at stake. Be afraid, incumbent progressives. People are about to pop with the need to get to the ballot box and express dissatisfaction. Last January, CBSnews.com ran a "report card" poll on the President's performance in half a dozen areas. I don't know what the initial response looked like, as I didn't notice the poll at the time. In the meantime, however, it seems to have gone viral on Twitter. The comment thread, which CBS never shut down, is up to an astounding 39,000 entries and going strong. Also interesting is that the results of the poll now show a a solid "F" grade. The comments are harsh, too, despite the occasional forlorn appearance of an Obama supporter who tries to rally his friends to participate in the poll, wondering "Is this for real?"